Chandler Burgess enjoying a deep Vermont day the week before Christmas, 2010. Killington sidecountry. Want to feel like a Killington local? Read this quick overview about the resort’s local geography and weather patterns and you’ll be on your way. Killington is located in the Green Mountains of central Vermont, about 10 miles east of Rutland. 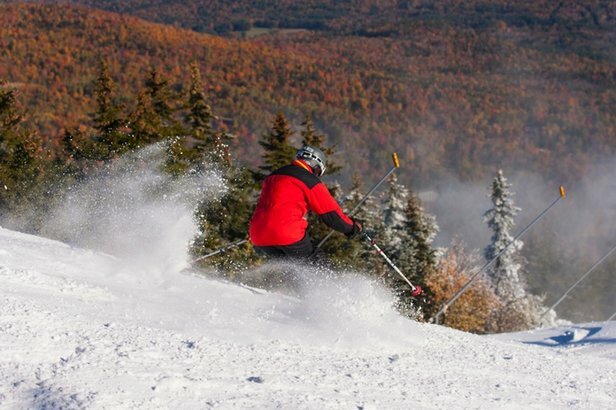 The resort is made up of six separate mountains with summits ranging from a high of 4,241 feet at Killington Peak to 2,456 at Sunrise Mountain Peak. The vertical drop from the summit of Killington Peak to the Skyeship base area is 3,050 feet, comparable to many western resorts. 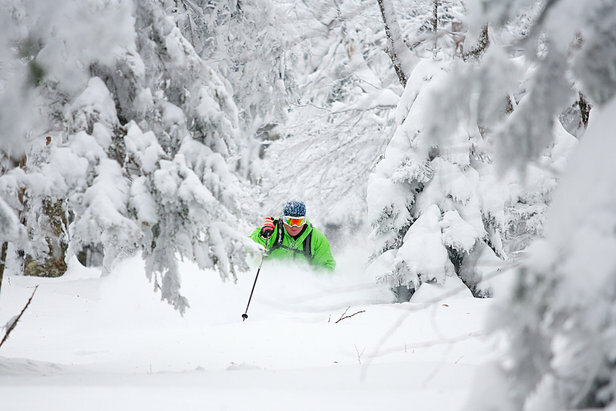 There are a few reasons why Killington is one of the most popular resorts on the east coast, and this list includes natural snowfall, snowmaking and its central location. The atmosphere is often kind to the Green Mountains, which serve as a formidable barrier to moist winds that blow from the west and northwest after a storm moves through. The town of Rutland to the west of the mountain sits at about 800 feet while Killington Peak measures more than 4,200 feet. When the air blows from the west, it is forced to rise above 3,400 feet in elevation over fewer than 10 miles. As the air rises, it expands, cools and its moisture condenses into snow. This is called orographic lift and it contributes greatly to the 250 inches of average snowfall measured just below the summit of Killington Peak. The resort’s popularity also stems from its extensive snowmaking system. This network of over 1,500 snow guns covers 80 percent of the mountain and can pump 12,000 gallons of water each minute. This pumping capacity (which directly translates into how much snow the resort can produce through its snow guns) is one of the highest in the country and ensures seasons that stretch from early November through late April or early May. 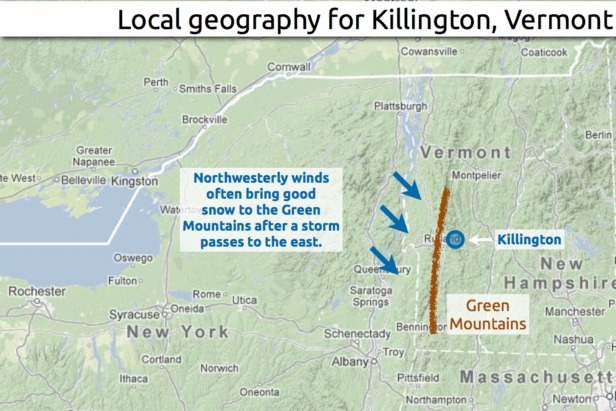 The beauty of Killington is that it combines the excellent orographics of the high Green Mountains with a location that’s centralized to much of New England. The resort is about three hours from Boston, four-and-a-half hours from New York City and about six hours from Philadelphia. This provides the large population of the northeast corridor access to a mountain that measures more than 20 feet of natural snow and stays open for over six months. Now that you know the local geography and weather patterns at Killington, the only thing left to do is enjoy your day on the hill. Learn how to predict the weather like an Sunday River local using these tips from Meteorologist Joel Gratz.